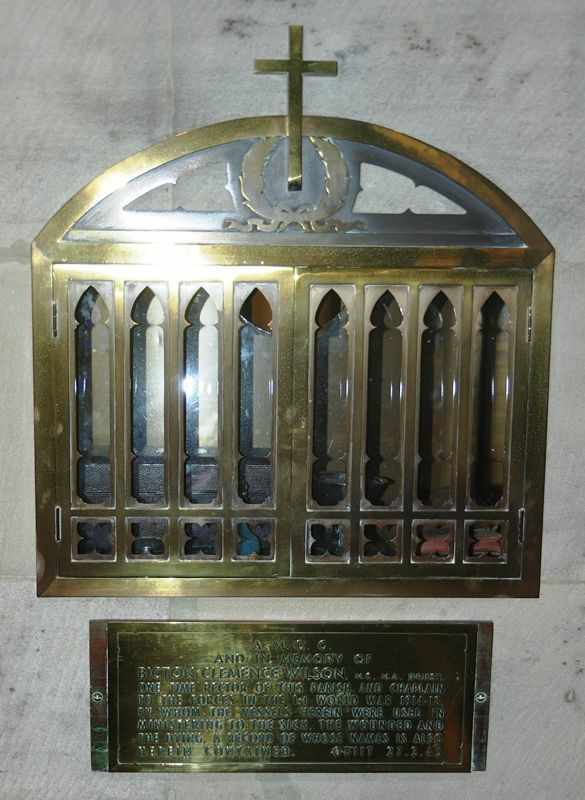 An aumbry and plaque placed in memory of Bicton Clemence Wilson, who was a Rector of the Parish, and a Chaplain to the forces during World War One. Reverend Canon Wilson died in 1945. The aumbry contains vessels used by the Reverend Wilson in administering to the sick, the wounded and the dying as well as a record of their names. On Monday night of last week a large congregation assembled for the service of dedication of the aumbry, recently placed in the Soldiers' Chapel in St. Alban's Church, in memory of the Revd. Canon B. C. Wilson, M.C., M.A., chaplain in World War I., and afterwards Rector of Muswellbrook. There was a large representation of returned men, including officers and members of the Muswellbrook, Scone, Aberdeen and Denman branches of the R.S.S. and A.I.L.A., and a number of other visitors from the same areas. From Newcastle, Mr. N. Morris, co-founder, with the late Canon, of Newcastle Legacy Club, was also present. The family was represented by Mrs. P. Wilson, Miss Mary Wilson, Mrs. Jack Davies and Mr. Peter Davies. After the service, a procession of the clergy, led by the crucifier (Mr. M. Muller) and the churchwardens (Messrs C. G. Edwards, J. W. Constable and H. J. C. Osmond) moved to the Soldiers' Chapel, where the Rector, on behalf of the parishioners, asked the Revd. Keith Single to unveil and dedicate the memorial. The faculty was read by Canon W. M. Ramsay Campbell. The Revd. Canon K. Single then unveiled and dedicated the aumbry in the name of the Trinity. The purpose of the aumbry is set forth in the inscription which reads: "A.M.D.G., in memory of Bicton Clemence Wilson, M.C., M.A. (Priest), one-time Rector of this parish and Chaplain to the Forces in World War I., 1914-1918, by whom the vessels herein were used in ministering to the sick, the wounded and the dying, a record of whose names is also herein contained." Muswellbrook Chronicle (NSW), 21 October 1947. Note: An aumbry is a recess in the wall of a church or cupboard in the sacristy where sacred vessels, books, vestments etc., are kept.